I don’t fry fish very often, but for catfish, I think it needs to be fried. I made this for my son-in-law and grandsons (mama was away) and it went over very big. We all loved it! My farm-raised catfish was not large fillets, but if you get large ones, I would suggest cutting them in half. Set a wire rack over a rimmed baking sheet and place in oven. Heat to 200 degrees. Place 1/2 cup flour in a shallow dish. In another shallow dish, mix the remaining 1/2 cup flour, cornmeal, 1 teaspoon salt, 1/4 teaspoon pepper, and cayenne. In a third shallow dish, whisk eggs with 1 tablespoon of the oil until uniform. Pat the fish fillets dry with paper towels and sprinkle each side with salt and pepper. Drop the fish into the flour and shake the dish to coat. Shake the excess flour from each piece, then, using tongs, dip the fillets into the egg mixture, turning to coat well and allowing the excess to drip off. Coat the fillet with the cornmeal mixture, shake off the excess, and lay the fillets on another wire rack set over a rimmed baking sheet. Heat 1/2 inch of oil in a large heavy-bottomed Dutch oven over high heat (I used a very large cast iron skillet) until the oil reaches a temperature of 400 degrees. (The oil should not smoke, but it will come close.) Place 2 or 3 catfish fillets in the oil and fry, turning once, until golden brown, about 4 minutes. Adjust heat as necessary to keep oil between 385 and 390 degrees. (Use a candy/deep-fry thermometer or an instant-read thermometer that registers high temperatures to gauge the temperature of the oil.) Remove the fillets from the oil with a slotted spoon and lay them on a plate lined with several layers of paper towels; blot to help remove any excess oil. 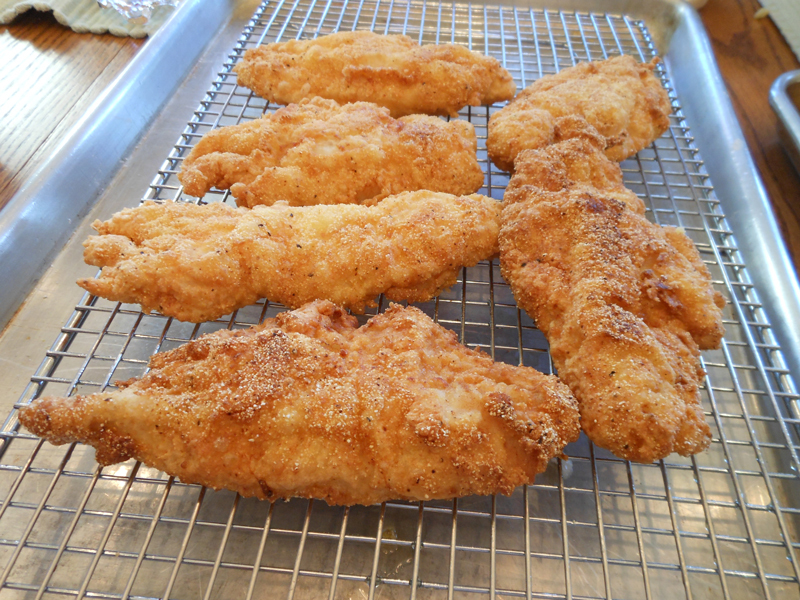 Transfer the fried fish to the wire rack in the warm oven. Bring the oil back to 400 degrees and repeat the cooking process with the remaining fish fillets. Serve with lemon wedges or tartar sauce.